Day 1: Start early and sail to Port Jefferson. This is about a 5 hour sail from Western LIS at 6 knots. 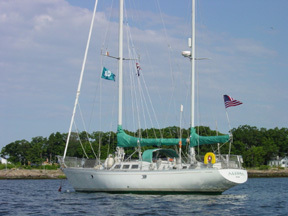 The anchorage is easy, moorings are often available, and there is launch service from the main harbor. Visit the town in the afternoon. There is plenty to see and do. Shopping, dining, people watching galore. Day 2: Have a leisurely morning and set sail for Zeigler’s Cove near Stamford on the CT side for a quiet evening at anchor or sail to Northport on Long Island for a quiet evening at anchor at Price Bend. There is little to do at either spot except watch visiting boaters and enjoy the natural beauty, which is a nice balance to the urban experience of the day before. Choose the destination based on the direction the wind is blowing that day. Day 3. Return to your home harbor. Either destination is about a 2.5 hour sail from Western LIS at 6 knots.